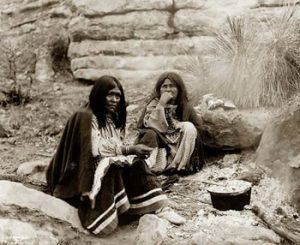 Like their Navajo cousins, the Apache people were Athabascan. They moved south into the south-west part of North America from their home in Canada about 1400 AD. So when the Spanish invaders came in the 1500s, the Apache hadn’t been in the Southwest very long. In the late 1600s, the Pueblo people captured a bunch of horses from the Spanish invaders and sold the horses to their neighbors. So the Apache got horses and learned to ride them. Apache soldiers became excellent riders, much better riders than most Spanish soldiers. Horses let the Apache catch and kill more bison than they had before, and also helped them win battles with the Pueblo people and with the Spanish settlers. But most of the time, Apache people were trading with their Pueblo and Spanish neighbors as much as raiding them. Maybe they didn’t really care very much about the difference. Either way, these different groups were exchanging stuff – sometimes more or less peacefully, other times less peacefully. Apache people traded bison meat and hides to the Pueblo people in exchange for corn, cotton cloth, and stone tools. The Apache also traded with Spanish villagers for guns, metal tools, and horses. This trading and raiding went on for more than three hundred years, until about 1850. Where did cotton come from? About 1850, however, English explorers found gold in Apache territory. Hundreds of miners rushed there to try to get rich quick. These miners were not used to Spanish or Apache or Pueblo people, and got into a lot of fights with them. The miners demanded that the United States government get rid of the Apache. So United States soldiers began to force the Apache people onto reservations. After the end of the Civil War in 1865, lots of United States soldiers came West to fight Native Americans rather than go back home. 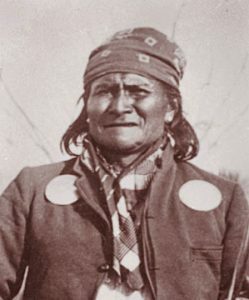 By 1886, the last independent Apache people, with their leader Geronimo, were forced to surrender to the United States army. On the reservations, Apache people found themselves with no way to get money or stuff. The bison they had always hunted were gone now. The reservations were on poor land, so you couldn’t farm it either. As the Apache became poorer, many United States officials thought that Apache children would be better off growing up in white families, and they took many Apache babies from their parents so white people could adopt them. Today, even though nobody is taking Apache children anymore, most reservation Apache are still very poor and have trouble finding work to do. Did you find out what you wanted to know about the Apache? Let us know in the comments! Want to learn more about the Apache? Check out this article from the Encyclopedia Britannica! Cite this page: Carr, K.E. 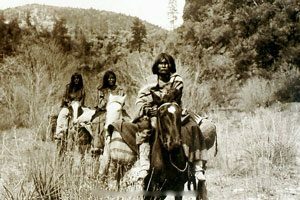 The Apache get horses – American history. Quatr.us Study Guides, August 12, 2017. Web. April 23, 2019.